Heart & Sole Colour Dash is back & bigger for 2018! It’s back! The hugely popular Armagh City, Banbridge and Craigavon Borough Council’s Heart & Sole Colour Dash 2018 will be bursting into Lurgan Park on Sunday 13th May. You don’t have to be an athlete to take part, you can run, walk or a mixture of both – the colour dash is entirely for fun! The event kicks off at 2pm with a fun group warm up before runners and walkers take to the course getting doused with colour powder at various points. Once over the finish line, there will be lots to keep you entertained. A bouncy castle, face painting, balloon modelling and of course our DJ counting down to a ‘colour throw’ that will fill the sky with an amazing rainbow of colour. Adult tickets cost £15, children 3-14 years £10, a family ticket (2 adults and 2 children 3-14 years) cost £35. All proceeds from the event will be going to the British Heart Foundation Northern Ireland. “This is a fantastic event for novice runners and walkers of all ages and abilities – it is not a race just simply a colourful afternoon of fun! 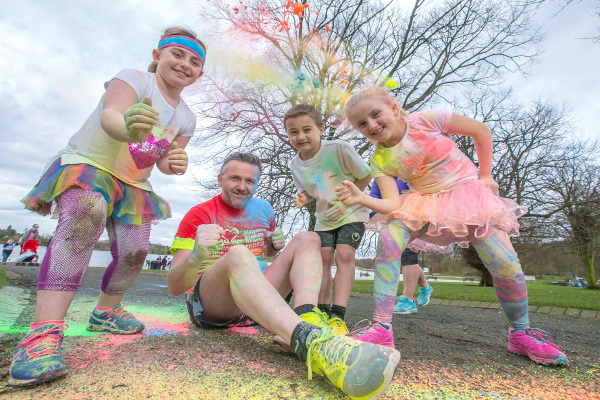 The colour dash is also a great opportunity for families and friends to get outdoors, enjoy the park, have fun, exercise and raise vital funds for charity” said Deputy Lord Mayor of Armagh, Banbridge and Craigavon, Councillor Sam Nicholson. So don’t miss out, get signed up, come along and enjoy the party atmosphere at this year’s Heart & Sole Colour Dash, organised by Armagh City, Banbridge and Craigavon Borough Council in association with the Public Health Agency, British Heart Foundation Northern Ireland, Ulster Carpets, House of Sport Intersport and Tesco.